But what if you did away with the fan? What if the heatsink itself rotated? Well, believe it or not, rotating the heat exchanger obliterates the boundary layer, removes the need for a fan, and it’s so efficient that it can operate at low and very quiet speeds. 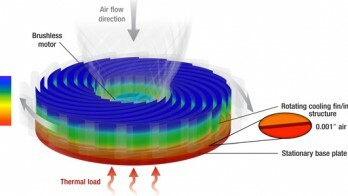 via The fanless spinning heatsink: more efficient and immune to dust | ExtremeTech.